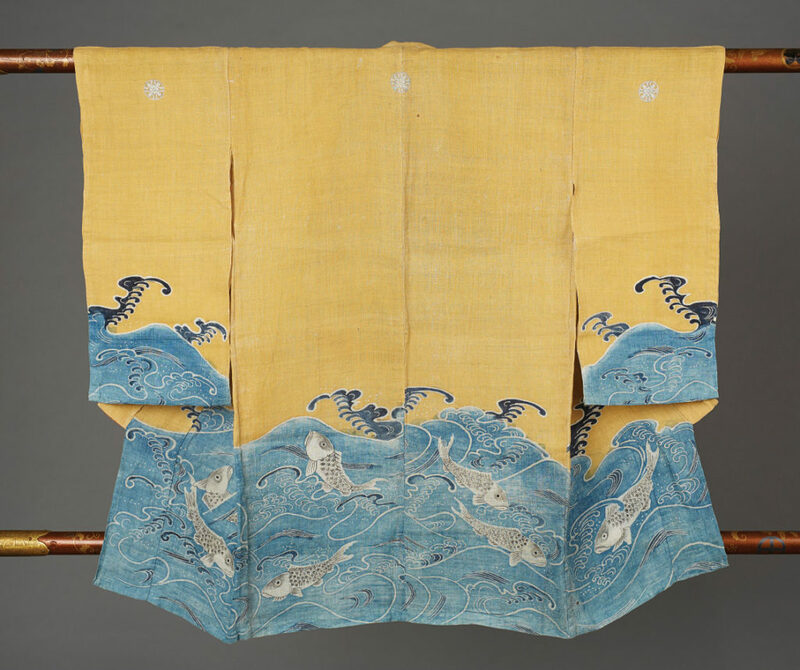 Miyamairi Kimono with Sea Bream Design, mid-19th century, asa with resist-dyed and hand-painted designs in yellow, indigo, and black, Marita and David Paly Collection. Throughout history, in most of the world, children’s clothing was simply a smaller version of what was worn by adults. In Japan, the kimono was the universal garment, worn by men and women of all ages. While children often wore hand-me-downs from their elders, for special occasions the preference was for garments with auspicious motifs, such as cranes and dragons—symbols of long life. Seven of the 20 works in this exhibition are miyamairi kimono, spectacular works with hand-painted designs made for a toddler’s first visit to a Shinto shrine. Others show a dazzling variety of patterns and dyeing techniques, including kasuri (where the threads are tie-dyed before being strung on the loom) and tsutsugaki (a resist technique where designs are drawn on the cloth with rice paste). Of special interest are the omoshirogara, the “novelty designs” that came into vogue in the 1910s through 1930s. Often playful in nature, these feature modern imagery such as airplanes and teddy bears. Spanning from the mid-19th to the mid-20th century, the kimono and banners in the Paly collection evoke the magic of childhood in traditional Japan. Curated by Maribeth Graybill, Ph.D., The Arlene and Harold Schnitzer Curator of Asian Art.